Ahead of today'sBack to the Future DayI was lucky enough to speak toJohn Bell, who was visual effects director on bothPart 2andPart 3. As we all know, in the second film Doc and Marty travel to an imagined 2015 and given that's where we are now, I was curious to know how John went about imagining what the future might actually be like. James O'Malley: So when you joined BTTF2, how did the process of designing 2015 begin? John Bell: It was interesting. It was 1986 and I was at Industrial Light and Magic working in the art department and I had just finished work on Willow. ILM management came in and said “we don't have a script but [Director Robert 'Bob' Zemekis] wants to do a Back to the Future 2. We don't have a script and all we know is we're going 30 years in the future and there's something called a hoverboard. So why don't you come up with some ideas and we'll package things up and send 'em down to him, and see what he thinks”. So I started drawing some ideas, some initial ideas on what Hill Valley could look like and then I remembered a formula that Syd Mead used on the film Blade Runner when he had to design the future. He also had to go [...] 20 or 30 years in the future so he looked 20 or 30 years back and so [...] I used the same formula. I was living in 1986 and I had to project out to 2015 so I went back to 1955… 1956.. mid-50s and took a look at what cars looked like, what clothing looked like, and buildings and graphics and things like that. I looked at that, studied that and compared it to 1980s and kind of built an evolution off of that. “Okay, if that much changed in those 30 years, we'll project that this much is going to change in the next 30 years”, so that was the formula for creating more drawings. I used that as a balance point. And you know we got some things right and some things we missed but the commonality was that we were living in Hill Valley which is a small suburban town, pretty much like the town I grew up in so I had a good knowledge of what the suburbs felt like and y'know it was going to be optimistic world, and colourful and easy-going. So I just translated that into my ideas for the future. Also another part that was helpful was the 80s being such a colourful, graphic decade that I really enjoyed, that I would take that and use that as an element to go into the future. There was a great magazine out of Britain, ID Magazine - you know the winking person on the cover? That had so much great graphic horsepower to it, that I reference those magazines a lot, 'cos I love the sensibility that was going on in those. So that was another layer that I added into it. And when Rick Carter, the production designer, got on board with the film he had seen the drawings that I had done a couple of years earlier and he is also a very optimistic, upbeat guy and he reacted well to the drawings I had done, and evidently Bob Zemekis had reacted well too. James: I read that you came up with a “15:85” ratio when it came to designing futuristic objects? John: Yeah, that was something that when you're designing stuff for the future you don't want to make things so abstract where people are perplexed: “what is that thing? I can't understand it, I can't relate to it”. So I always want to try to - even in other design projects I get involved with - I always wanna try to put something familiar into the object or costume or graphic that I'm designing because I think that helps… so it helps the audience attach itself to it. It could be a familiar colour or pattern or texture or shape. [...] The perfect example we were able to use in the movie is the [...] taxi. It didn't start out as a Citroen DS19, but the shape I had drawn looked kinda like a DS19, so when it came time to make the car for the film we took a DS19 which was about 85%, and then we took the colours and graphics and all of the little doo-dads that we added onto it, that was the little 15% twist. And I think the same thing is with the hoverboards too you've got a very iconic shape of a skateboard but it has this 15% technological twist on it, you're not sure how it works but the shape is so familiar that I believe it. I believe this thing is going to ride and ride and ride. James: Re-watching the trilogy recently I was surprised how prescient a lot of the technology was. One favourite thing was the shot of a drone walking a dog, which appeared in the background of one of the shots..
John: Yeah there was the drone dog walker… [...] I can't recall now if that was even in the script. [...] it turned out that they actually used the great dane I had put into the drawing into the film at the end. I had no idea it was even going to make the film. I'm not even sure if the drone dog walker was even part of the written script or not. When I did the drawing it just kind of struck me funny and evidently it worked for Bob [Zemekis] and [screenwriter] Bob Gale. James: Were there any sources of inspiration for the tech? There's lots of stuff like video conferencing and the drone. Did that come from the script or was that just you hypothesising? John: Y'know I'm trying to recall. I wish I had hung on to my copy of the scripts but I didn't. I'm thinking the drone - I dunno if they used the word drone - for the one that… the news reporter one that takes the picture of Griff after the hoverboard incident - but obviously we had to visualise what all of that stuff looked like. So you just kind of freestyle about where you want to go with it visually and I threw in the USA Today moniker because it seemed to fit the suburbs, y'know the very popular, very colourful publication. 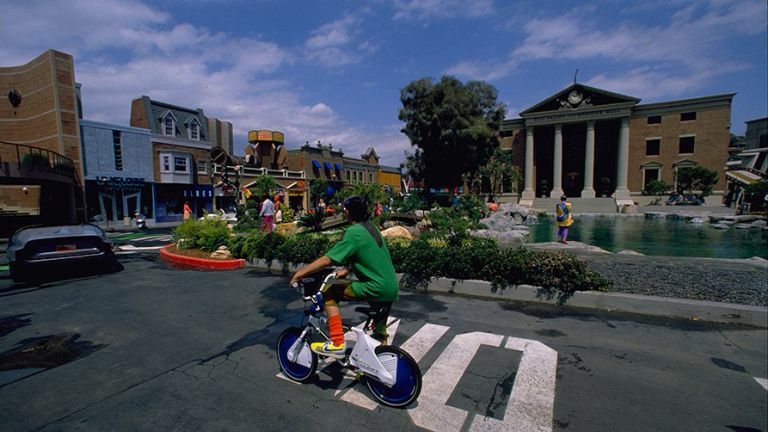 And it's a very colourful world we're creating for Hill Valley [...] - the rest of all the gadgets and everything was to make it look interesting and funny. James: We're now talking 30 years after the film came out, you've worked on Pirates of the Caribbean and Jurassic Park. From your vantage, how has visual effects changed? Has CGI completely changed how you approach visual effects? Or is it more like changing the tools? John: Yeah, it's more like changing the tools and what's really changed for me is back then, when I was working on Jurassic Park and Back to the Future, you could get away with doing a drawing that is pretty loose, and just using markers and pencils, and the tools to visualise your ideas were very simplistic. [...] It took the vision of a director to really bring those things to life and bring that added reality to the things that you were designing. Want a hoverboard? Here's how to get one. Nowadays the concept art is so.. I'm going to say it's very burdensome because it involves so much sophistication with 3D, tools and making your concept art [...] - they want it to be so photorealistic and so tight that it takes the collaboration out of the process. Y'know you can't just show somebody a loose sketch, feed off it, and interpret [the image]. Today it'd have to look like a film…like a frame right out of the film before they move forward with it. It's not so much [that] CG has changed the process and the final product, but it's how CG changed the process of how things are done. I don't know if that makes sense or not - that's how it's impacted me. It forces you to come up with something very final, very early on. I'd rather have the more loose interpretation and impressionistic views on the sketching and let other people contribute their ideas to it. James: Do you design things thinking “this would work better as a practical effect?” - does CGI make the arguing to go with the expense of practical work more difficult? John: For me when I'm doing effects work it's through ILM and ILM is all digital. They don't do anything practically anymore. [...] There's not even a discussion about what's going to be practical or digital at that point. It's already been decided. James: We're talking about BTTF 30 years out - did you think the films would have this amazing legacy? Do you think in 30 years people will still be talking? John: No, I think we got incredibly lucky. Somehow we created an idea of what 2015 would look like and it resonated with people on many different levels obviously and I think part of it is [the real 2015 has] these past 30 years [...] got progressively darker in a lot of areas of the world and I think Hill Valley is a little oasis where people can hold on to this bright, colourful, optimistic look at the future. The Back to the Future trilogy 30th anniversary edition is out now on DVD and Blu-ray.